1935 That summer the family spent some time living in San Roque in a pension. 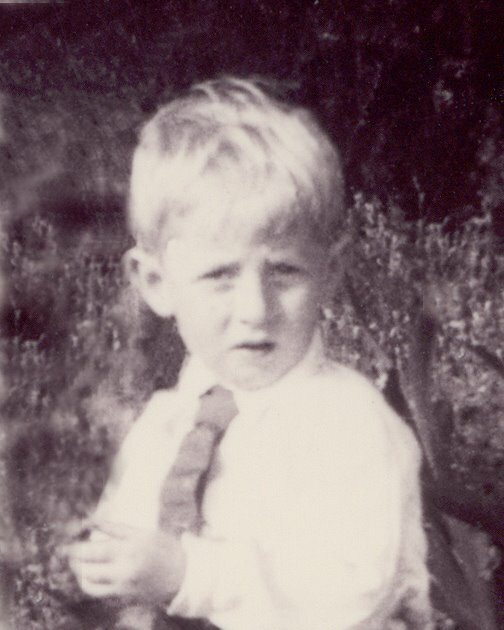 Eric was convalescing from some childhood ailment or other. Perhaps he was still feeling the effects of the diphtheria. According to the dictates of the time this required a 'change of air'. One day while playing with local children in the Alameda he noticed the military barracks looming in the background: a premonition perhaps of things to come. Later at the dining room of the Pension, Lina noticed two foreign looking men and asked the waiter who they were. 'Son unos personajes Alemanes,' he replied. For Eric the word 'personajes' had a sinister ring. This, coupled with 'Alemanes', made it impossible in Eric's eyes for them not to be anything else but spies. Who knows, they may very well have been. The Civil war was just round the corner. When the family returned to Gibraltar the lights and the decorations were up for the Jubilee of George V. The next day they had a grandstand view of the celebrations from the windows of 256 Main Street. The cavalcade in honour of the event was made up of alternating ranks of British and Spanish cavalrymen. During summer Lina's (1.2) children would sometimes visit their cousins in Schomberg Cottage. It was a great place with a magical garden that resembled a miniature jungle. There they would play for hours. Then, tired and hungry from messing about in the undergrowth, they would return to the house where Mary, Maurice's mother, who was a charming old lady, would offer them the most exquisite scones baked by her own hands. 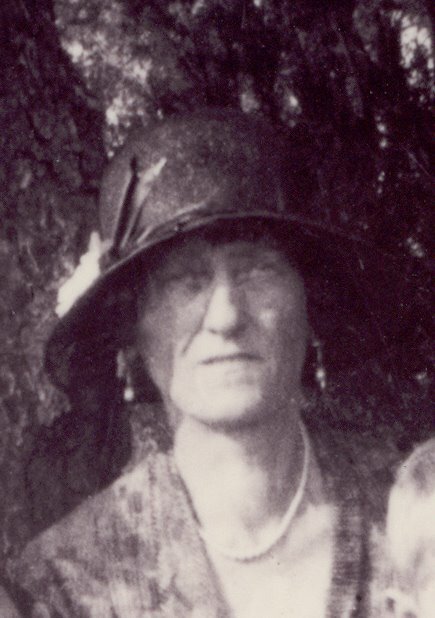 Mary Relle Wills. No relation but a great scone maker. Another source of enjoyment during these visits was Edwin Wills, brother to Maurice senior and an amateur conjurer who often tried out his latest tricks on the children. 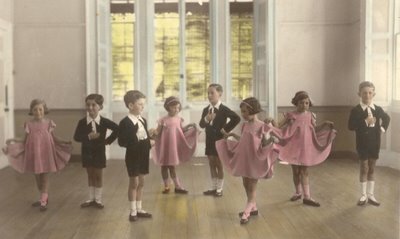 He must have explained how to do one or two of the simpler ones as some of these continued to be used by adult members of the family to keep the younger ones entertained for years to come. Many years later Schomberg cottage fell victim to developers. In the autumn the Italians began their military operations against Ethiopia. The League of Nations imposed sanctions and for a while it seemed as if they would intervene. At the time Eric was, somewhat surprisingly, at Sunday Mass in the Cathedral. Suddenly the British destroyers in the harbour began to sound their distinctive sirens. There were a number of naval ratings at Mass and within minutes the Naval Patrol entered the church and ushered them out. To a young boy it all seemed very dramatic. 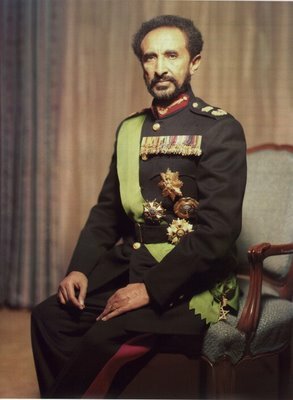 But neither the British nor the League took any action and Ethiopia suffered the consequences of the invasion on its own. Later the family again had a grandstand view from 256 as the Negus, Haile Selassie, Lion of Juda, passed through Gibraltar on his way to exile. Local political battles also continued unabated and the Exchange Committee, the Chamber of Commerce and the Transport Workers Union allied themselves for the first time to offer the Governor their views on a new Estates Duty Ordinance. The Governor rejected their advice. They allied themselves again, and petitioned him to restrict his appointees to local people. He noted their petition but as usual took no action. They then held a public meeting and sent a memorial to the King himself. The matter was debated at Westminster but the answer was still no. In Spain the Republic began to notice that many properties had been purchased in the Campo area by British Nationals. Fearing quite reasonably, that this might become a pretext for further encroachment by Britain under the excuse of protecting British property, they forbade new purchases. Y le partio la boca. Eric incidentally was a keen supporter of the Prince of Wales. He even wore their badge on his lapel. 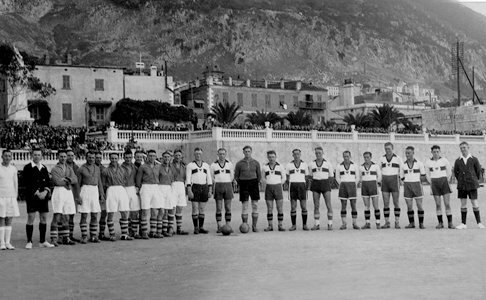 Footballers posing in the old Naval Ground. I am not sure who these footballers are but this is where the Gibraltar teams played. So did I during my school days. 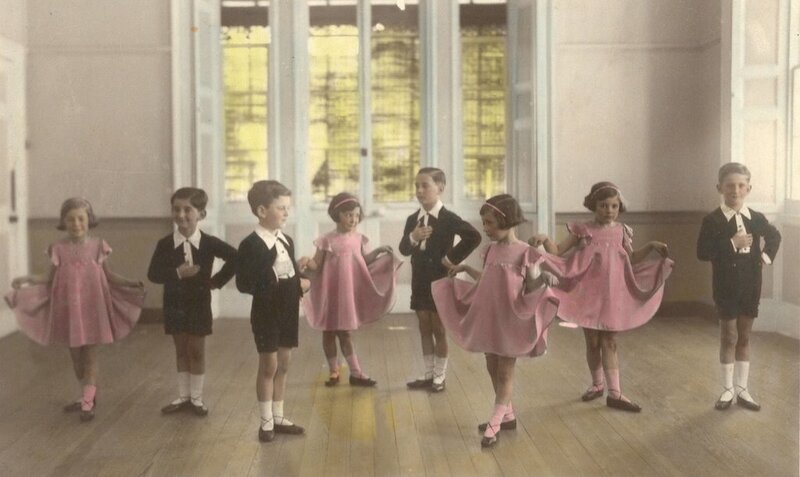 The Dance School. It’s almost unbelievable but yes that is my brother third from left. I asked my brother for details about this photograph but he says he cannot remember the circumstances. Knowing his phenomenal memory I suspect he wasn’t trying too hard to remember. I can’t say I blame him. The original is a tinted photo printed on a postcard. 1936 In Spain José Calvo Sotelo, the moral leader of the Right, was killed two days after a Communist deputy had openly threatened his life. Calvo Sotello's death aggravated the already tense political situation in the country. By the 17th of July the Spanish Civil War had begun. An army mutiny in Spanish Morocco led by General Francisco Franco Bahamonde spread to the mainland and in 48 hours involved the whole country. In Madrid and Barcelona the military mutinies failed, and the Republican government began its unsuccessful struggle against the rebel 'Nationalists' or 'Insurgents'. During the conflict, as elsewhere in Europe, opinions in Gibraltar were divided. The Gibraltar Chronicle, for example, made no bones about calling the Republicans 'Reds.' Its opinions, in so far as they reflected those of ordinary people, however, were rather irrelevant as it was not a Gibraltarian newspaper at all, but the mouthpiece of the Colonial Establishment. On the other hand Freemasons, of which there were many in Gibraltar, were hardly likely to favour Franco who was known to have a paranoid hatred of the society. The working class in general and members of the TGWU in particular were just as likely to lean towards the left as the wealthier trading class and the clergy were towards the right. 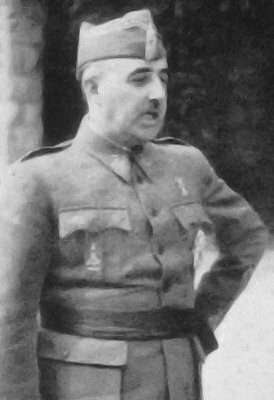 General Francisco Franco Bahamonde. Unfortunately the generalissimo would become a permanent fixture when I was young. 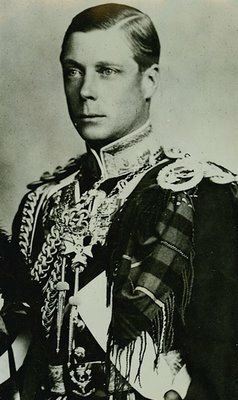 The year also began ominously in Britain with the death of George V in January and the subsequent crowning of Edward VIII. He was later to abdicate because he wished to marry 'the woman I love'. Unfortunately she happened to be a divorcee. Edward VIII. We owned a gig-saw puzzle with a very similar picture as this one. I completed it many a time when I was a boy. In the stagnant atmosphere of a fortress colony, politics rarely rose above the parish pump level. People tended to be politically uninformed and many opinions would have been formed in ignorance of the issues involved. Generally speaking, however, a majority of the population were probably more in sympathy with the Nationalist than in the Republican cause. The decision by the Fascist Powers to help the Nationalists probably made little difference to their overall opinions. 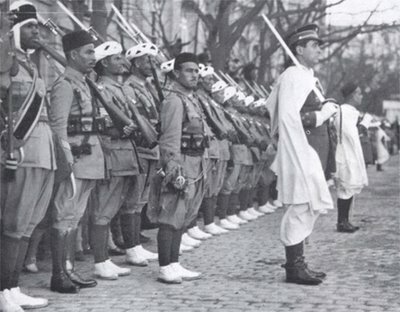 As a largely religious community, Gibraltarians were influenced by Nationalist propaganda which labelled the rebellion as a crusade in defence of religion, and made capital of the violent anti-clerical activities of extreme elements within the Republic. It was only with hindsight that the full horrors of Fascism and Nazism became clear. The non-interventionist policies of the Western Democracies must also have had a strong influence on Gibraltarian public opinion. Throughout the conflict Spanish workers continued to enter the Rock to work in the dockyards and elsewhere. That first day of the war Gibraltar had a grandstand view as the Republican air force crossed the Straits to bomb, and miss, the Spanish Army barracks at Tetuan. The next day saw many Gibraltarians in La Linea for the opening of the annual fair. Suddenly the mood turned ugly and clashes took place between the Syndicalists and the Fascists. Hundreds of Gibraltarians were caught in the fracas and returned to the Rock immediately. The gates at Four Corners were promptly closed. That night the soldiers at the barracks in La Linea mutinied and imprisoned their officers. Babs and 'Baby' Maurice were staying in San Roque that Saturday. Hearing a fracas outside the window of the pension where they were staying, young Maurice opened the window. Seeing some soldiers moving about he called his mother. My mother’s cousin Babs Wills and her son 'Baby' Maurice. When Babs looked out she found herself staring at the wrong end of half a dozen rifles held by an uncompromising squad of Moorish troops. Luckily the officer in charge had decided not to order his men to open fire. Franco’s Guardia Mora. These were the troops that very nearly shot Babs Wills and Maurice in La Linea. 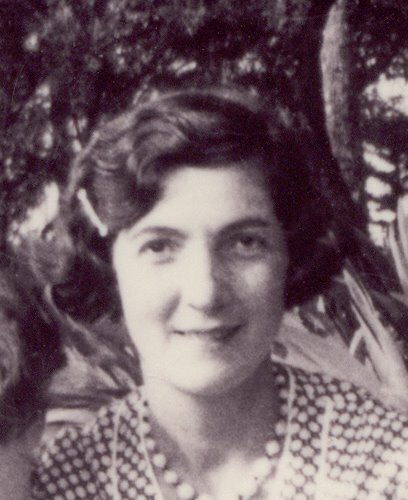 My grandmother’s sister, Carmen Vacca was also living in the family property in La Linea at the time. There are memories of her turning up in hysterics at 256 Main Street when the shooting started. Carmen was still relatively young when a malignant tumour caused one of her legs to be amputated. It was during one of her frequent trips to the United States that she acquired an artificial leg thanks to the generosity of a rich American friend. None of this, however, seemed to deter either her mobility, or her abrasiveness. She was in fact cast in the same mould as her sister Maria Luisa and seems to have spent much of her life shuttling between Paris in Texas, La Linea and Gibraltar. Periodically she would turn up at 256 Main Street in high dudgeon after quarrelling with her American daughter-in-law, Leola. Eventually, the inevitable friction with her sister would soon send her back across the Atlantic. 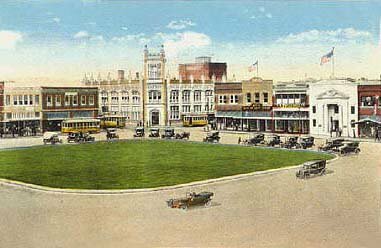 A not quite contemporary postcard of what I think is the main square of Paris, Texas. This was home to Willie Vaca and his wife Leola. He was Carmen Vacca’s son and Carmen was my grandmother’s sister. She was a frequent visitor.